Gone are the days when coffee shops were about grabbing a cup of coffee near me before you head to work. Today, they have become a culture – a place to celebrate life, meet friends, work, and spend quality time. So, it’s no wonder that every individual has their favorite coffee shop they often swear by. For some, a relaxing or cozy atmosphere makes all the difference. For others, it’s the delicious and fresh treats that keep them coming. 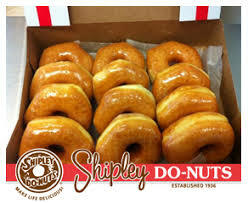 Wondering what makes Shipley Do-Nuts the best neighborhood coffee shop? Let’s find out! Luckily for you, Shipley coffee is brewing 24×7, making it possible for you to come whenever you want. You can indulge in the stimulating aromas, take sips of strong coffee, and strike up unforgettable conversations with your loved ones. Houstonians can relish Shipley coffee at Westheimer Road, whenever they experience a craving for coffee near me. You enter a coffee shop and hear the staff say, “Good morning, Susan. Would you like your regular black coffee with a dash of cinnamon and extra cream?” It makes you feel special, right? Shipley Do-Nuts is all about exceptional customer service. Being a neighborhood coffee shop, we know most of our customers. This gives us the edge to serve you the way you want. And that’s not all. We can also recommend new things that we are sure you would love to try. Get the Coffee You Crave! At Shipley Do-Nuts, you’ll find a wide range of fresh treats that go well with coffee. They will help you earn brownie points with your wife, too! And if you have kids waiting for you, don’t forget to buy the sprinkled donuts. You’ll be a happy recipient of lots of hugs and kisses! Bought a new book and want to read it with a cup of coffee? Head over to Shipley coffee, and enjoy your book with some soothing drinks and delicacies. Have an exam coming up and want to do some group studying with your friends? Come to your neighborhood coffee shop for a quick snack and study session! For those who have started working from home and need a place to meet their clients, we offer a great space to work and share ideas, too. Our coffee shop is clean, well-lit and full of warmth, for studying, working, reading and chit-chatting, too. Don’t worry. 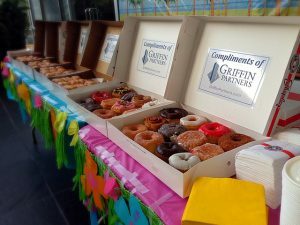 Give Shipley Do-Nuts a call, and we’ll deliver a lavish breakfast in no time. 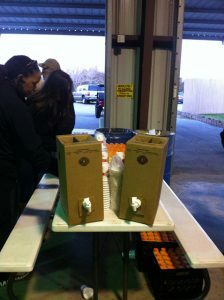 You can order your husband’s favorite coffee, some donuts, and Danish or Cinnamon Rolls and surprise him! Being in your neighborhood, we deliver super fast, ensuring that your coffee and food is always super fresh and super hot! When you’re looking for coffee near me, there’s no better joy than finding a neighborhood coffee shop that suits your palate. Choose Shipley Do-Nuts for a friends hang-out, a family brunch, or a business meeting. It’s got all the ingredients for the perfect coffee shop – the atmosphere, the food, the coffee and above all, the convenience! Always wanted a coffee shop like Central Perk in Friends? Now, you can have it all with Shipley! Visit our Westheimer Road or McKinney Street shops today or place an order for home delivery now! Call our Westheimer location at 713-589-3292 or the Downtown location at 713-651-3033.